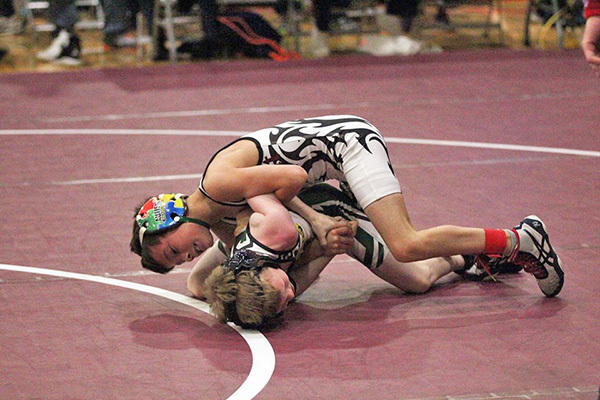 Tag Archive | "Drew Moro"
Pictured is Brody Compau, champion of the 46 lb 7/8 division. Photo by B. Chong. 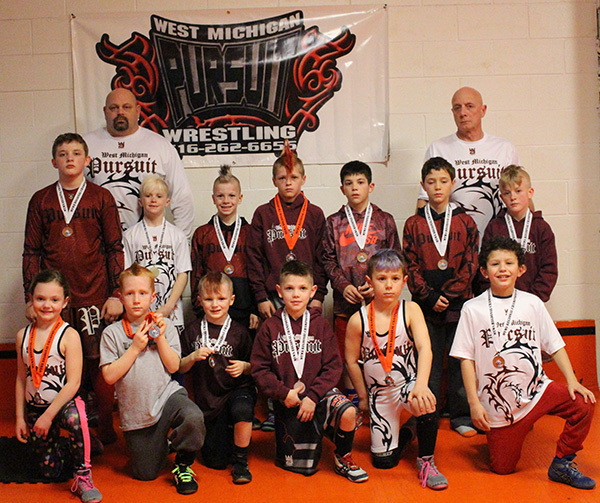 West Michigan Pursuit had two grapplers travel to Bay County this weekend looking to earn the Monster Medals and Championship rings offered for 1st Place. 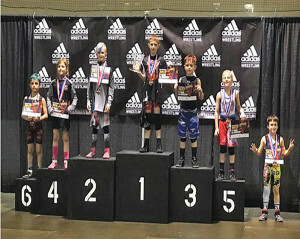 Both Drew Moro, 64 lb 7/8 age group, and 85 lb Blake Peasley, 9/10 age group, went undefeated and claimed what they came for, each earning another Championship Title. Moro also earned the Most Valuable Wrestler award. 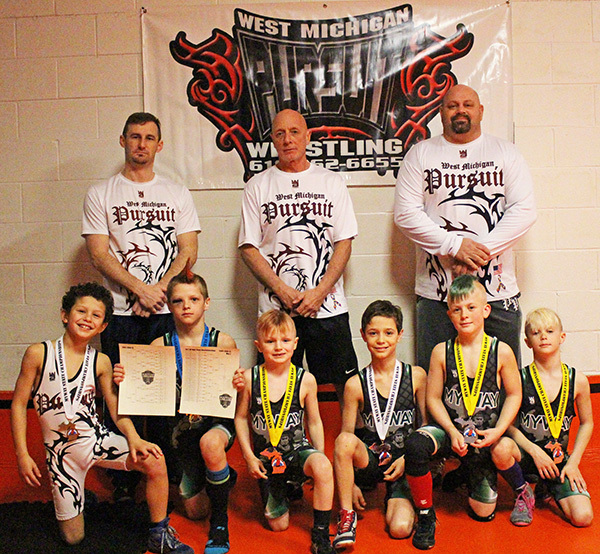 WMP had 16 grapplers enter the Orchardview tournament and placed 14 in the top 5. Orchardview was also a “Greights” tournament which attracts several tough competitors from all over the state. 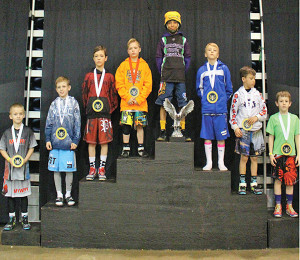 Isaiah Sostenes, 80 lbs 9/10 age group finished 5th. 52 lb Tatianna Castillo, 7/8 age group finished 4th. 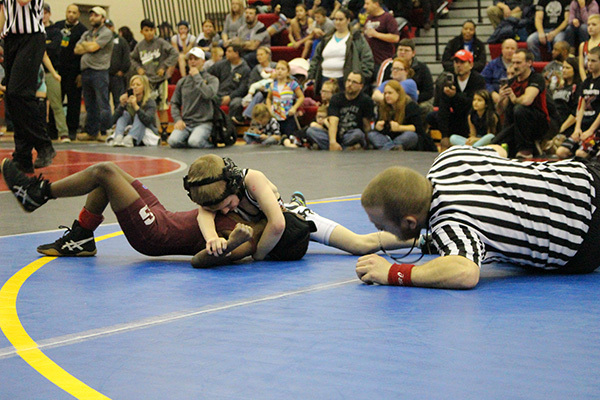 67 lb Evan Andrews, 9/10 age group; 95 lb Blake Hammer, 13/15 age group and 90 lb Isaiah Smith, 9/10 age group finished in 3rd. 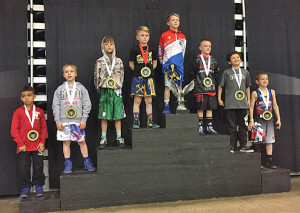 71 lb Luke Egan, 9/10 age group; 55 lb Kaleb Pautke, 7/8 age group; 75 lb Tyler Parmeter, 9/10 age group; 64 lb Aaiden Vasquez, 7/8 age group; 59 lb Kellen Weckesser, 9/10 age group and 67 lb Kamden Witte, 9/10 age group finished in 2nd. Champions of the day are 67 lb Quinten Cassiday, 9/10 age group; 46 lb Brody Compau, 7/8 age group and 70 lb Josh Vasquez, 11/12 age group. 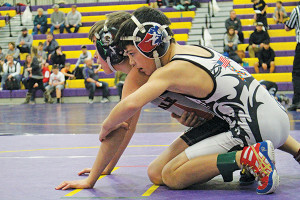 “I see growth in each athlete every week,” said Head Coach Dave Andrus. “I love having them light up when moves they drill at practice provide the intended result during a live match! We are the Pursuit of Champions,” said Head Coach Dave Andrus. Drew Moro claimed the 2017 Hawkeye National Title last weekend. Courtesy photo. The first tournament of the 2017-2018 MYWA Western Region was hosted by Kentwood wrestling. 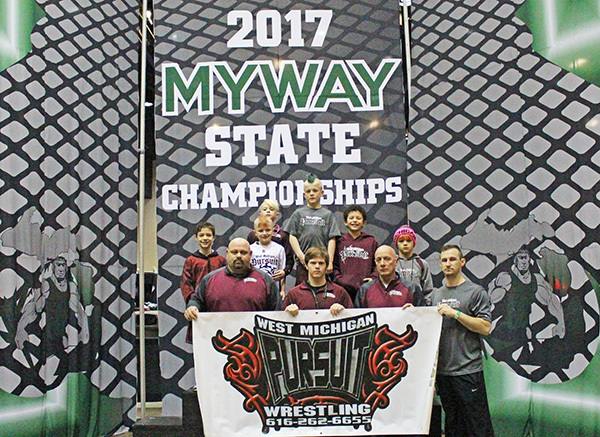 West Michigan Pursuit brought 16 grapplers to compete with one entering Novice and the rest entering the Open division. 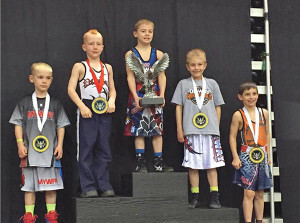 One grappler—Drew Moro—traveled to Iowa to compete at the Hawkeye Nationals in Iowa. On Saturday, December 2, Drew Moro bumped up an age group and entered the 3rd/4th grade division in the 66 lb wt class, finishing in 2nd Place. 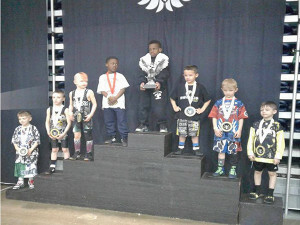 On Sunday, he entered his own age group, 1st/2nd grade division in the 65 lb wt class. 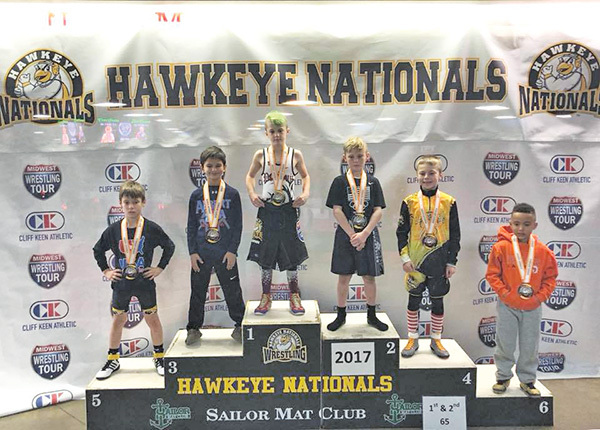 After two days of tough competition, Moro battled hard and claimed the 2017 Hawkeye Nationals Championship Title. 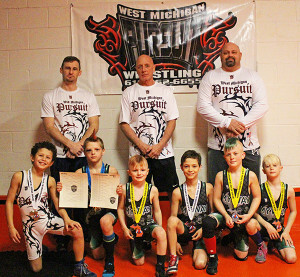 At the Kentwood tournament, West Michigan Pursuit placed 15 young competitors in the top three. Out of 60 battles, WMP claimed 43 victories. 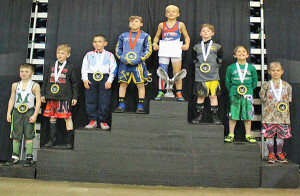 52 lb Tatianna Castillo, 7/8 age group; 64 lb Caden Green, 7/8 age group and 90 lb Blake Hammer all finished in 3rd Place. 55 lb Kaleb Pautke, 7/8 age group; 75 lb Tyler Parmeter, 9/10 age group and 85 lb Isaiah Smith, 9/10 age group all finished in 2nd Place. 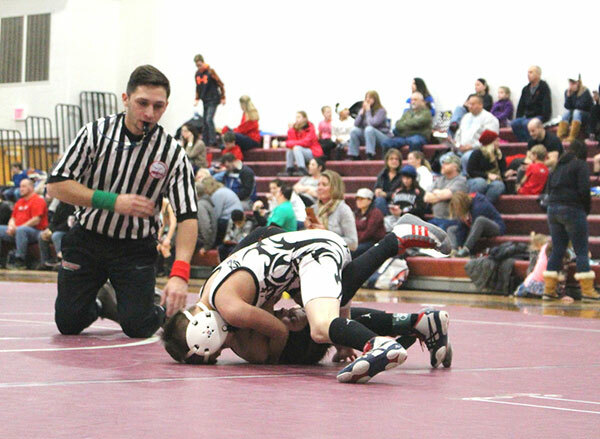 Both Pautke and Parmeter battled back and went 4-1 claiming their True Second. 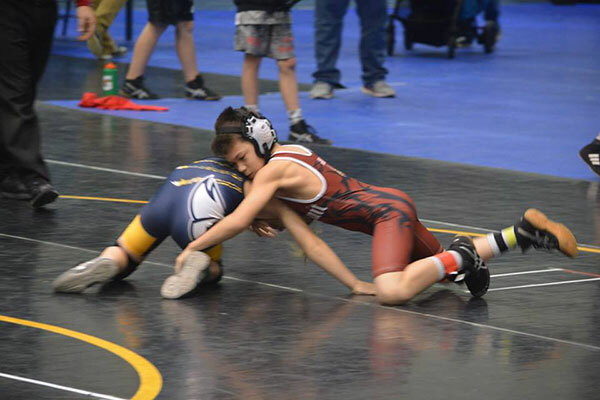 Champions of the day are 67 lb Quinten Cassiday, 9/10 age group; 40/46 lb Brody Compau, 7/8 age group; 71 lb Luke Egan, 9/10 age group; 90 lb Blake Peasley, 9/10 age group; 80 lb Isaiah Sostenes, 9/10 age group; 64 lb Aaiden Vasquez, 7/8 age group and 65/70 lb Josh Vasquez, 11/12 age group. “Each year I have returning champions, more who are training to gain that status and those looking to be a part of the continued success here at WMP. Looking at the team I have right now, I am very impressed and excited to see what the 2017 season brings,” said Owner and Head Coach Dave Andrus. If you are interested in learning more about this sport or if your wrestler is looking to compete at the next level, come check us out. We are located in the Cedar Springs Sports Plex. Practices are Tuesday and Thursday from 6:30 p.m.–8:30 p.m.